Those who take long showers use a great deal of water and energy. Yet people who enjoy taking long showers do not usually realize to what extent they are damaging the environment. However, if a clever measuring system shows current consumption, this immediately leads to increased efficiency. The consumption information available on the display is incentive enough to reduce water and energy consumption when showering on average by 22 per cent. This was shown by a study conducted by the Universities of Bonn and Bamberg, as well as ETH Zurich. The results have initially been published online in the journal Management Science. The print edition will be published soon. Environmental protection is very popular within society, yet it is often lacking when it comes to implementation. Many want to protect natural resources, but lose sight of the aim in everyday life – for instance, when showering. When you stand underneath a pleasantly warm jet of water, you quickly forget how much water and energy have already disappeared down the drain. "Most people only have a very vague idea of how energy- and water-intensive showering is," says Prof. Lorenz Götte from the Institute of Applied Microeconomics at the University of Bonn, who previously taught in Lausanne. "Many people think of switching lights off and more economical fridges when they think of saving energy. The average household in Germany and Switzerland consumes five and a half times as much energy when showering as for its entire lighting and four times as much as for the fridge and freezer together," says the lead author Dr. Verena Tiefenbeck, who researches at the University of Bonn as well as at ETH Zürich. Due to the energy intensity of heating water and the as yet unexhausted saving potential, a great deal more could be achieved in this area, adds Prof. Thorsten Staake, chair of the Energy Efficient Systems Group at the University of Bamberg. "The shower is an ideal starting point, because it's where more than two thirds of a household's hot water is required." How can the greatest amount of energy be saved when showering? For the three scholars from the Universities of Bamberg, Bonn and ETH Zürich, this concerns a very applied and also fundamental question of how resource-relevant behavioral changes can be brought about. 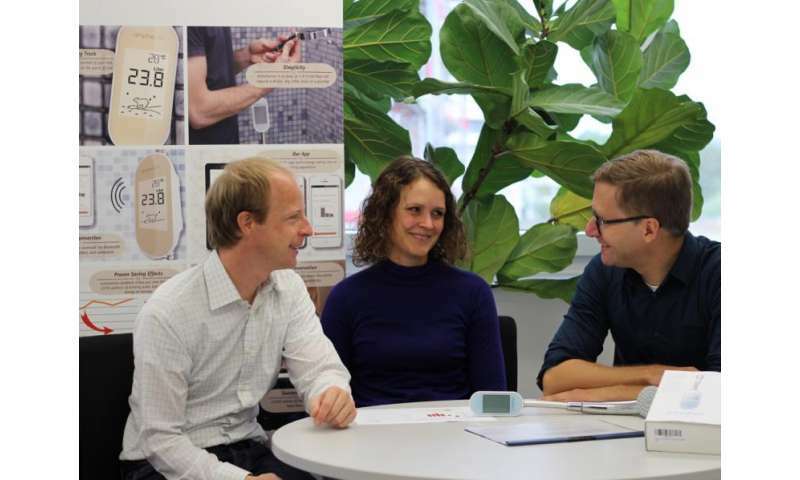 In multiple experiments, a total of 700 one- and two-person households in Switzerland received intelligent systems from Elektrizitätswerk der Stadt Zürich (ewz) to measure their energy and water consumption when showering. The measuring devices were fitted below the shower head. They allow water consumption, water temperature and energy use to be seen at a glance. "These smart systems give the agent direct feedback about the consequences of their own showering behavior," reports Prof. Staake. The measuring devices recorded the showering behavior of the subjects for around two months. A randomly selected proportion of the subjects was able to track live on the display how much energy and water they had used since the start of their shower, while other participants were not shown this information. If the test subjects received immediate feedback via the measuring systems, energy consumption when showering fell on average by 22 percent. For people who take long showers, the savings even came to almost 30 percent. In a further investigation, the researchers tested whether additional saving behavior occurs when the test subjects received subsequent feedback on their previous consumption. "This subsequent information resulted in virtually no additional effect," says Dr. Verena Tiefenbeck. Nevertheless, the study into shower use shows that lasting behavioral changes occurred during the two months of the experiment. Summarizing their findings, professors Götte and Staake say, "Even over the course of weeks, no desensitizing effects were seen among the subjects." Dr. Tiefenbeck adds that "The desired saving effects were just as great at the end of the observation period as at the beginning."